Developments in Earth and Environmental Sciences, 9. The Fly River and its tributaries, the Ok Tedi and Strickland rivers, are located in the Western Province of Papua New Guinea. All three rivers have their source in the rugged central mountain range of the island and eventually flow, via the Fly River delta, into the Gulf of Papua to the north of Australia’s Great Barrier Reef. With a catchment area still largely covered by tropical rainforest and relatively few human inhabitants, this remote part of Papua New Guinea presents a rare opportunity to document and understand the dynamics of a large tropical river system largely unaffected by human activity. In 1984 the Ok Tedi Mining Company Limited began mining copper and gold mineralisation from Mt. Fubilan, which is located at the headwaters of the Ok Tedi. In 1990, mining begin at the Porgera gold mine located at the headwaters of the Strickland River. Since that time both companies have intensely monitored the environment of the Fly River system in order to better understand the possible impact of mining. This book is intended to assemble and summarize this vast amount of information, much of it contained in internal company reports, to better understand the environmental complexity and dynamics of this large and relatively undisturbed tropical river system. The approach to be taken in achieving this outcome is to solicit contributions summarizing each of the scientific disciplines to be covered from recognized experts with experience in the region. 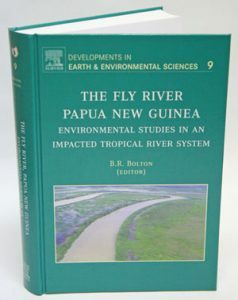 This book documents physical and biologic change in a large tropical river system brought about largely by mining in an otherwise pristine environment; brings together a broad rand of disciplines to provide a comprehensive overview of change in a complex and dynamical tropical river system based largely on previously unpublished company reports; and, provides examples of state-of-the-art strategies and methodologies for monitoring environmental impact in a large river system. 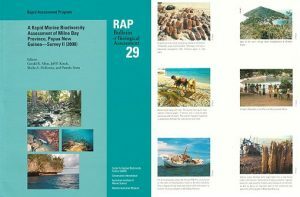 A Rapid Marine Biodiversity Assessment of Milne Bay Province, Papua New Guinea- Survey II (2000). Artist/Author: Allen, Gerald R. et al. The Marine Rapid Assessment Program’s goal is to rapidly generate and disseminate information on coastal and near-shore shallow-water marine biodiversity. Its surveys yield appropriate and realistic recommendations for conservation, and have, at times, resulted in the finding of new species. RAP Bulletin no. 29.